Looking for that perfect gift? Look no further!! 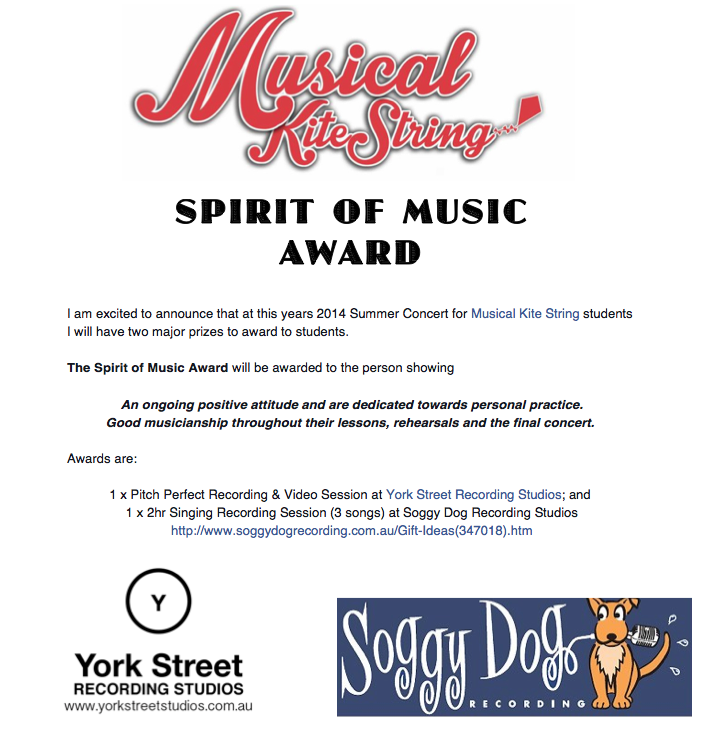 Musical Kite String in conjunction with York Street Studios is very please to be able to offer you the chance to have a professional recording and video done in their brand new recording studios South Melbourne. •	High Quality Video of the recording session. •	Vocal assistance from professional producers during the recordings. •	Video available to be used for upcoming television show auditions - make sure your audition is the best!! This offer is for a limited time only so please ensure that you call or email now to lock in your recording session before Christmas!! Call now on for an experience of a lifetime! Jazzaoke ~ Come sing with a live big band! I’m contacting you from MoJO, the Mordialloc Jazz Orchestra. We were wondering if you or anyone you know, might be interested in joining us in singing Jazz-aoke with MoJO at Dizzy’s Jazz Club. We play there semi-regularly, with our next session being Thurs 20th November. We call it Jazz-aoke because its kinda karoke but with a full big band. Members of the audience can come up on stage and sing with us. So it’s a great way for aspiring/returning jazz singers wanting to get experience or just have some fun singing with a live big band. We have a set list of around 70 swing, jazz and rock and roll tunes to choose from (see attached list). 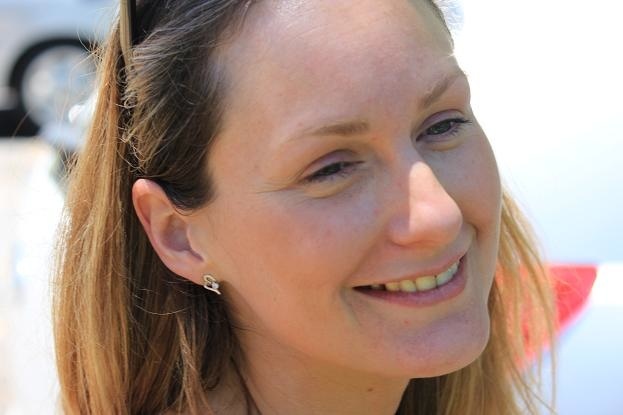 Our own singers Cathy, Dave and Sylvana also perform in between our guests and can provide advice and guidance. If singers come along a little early there is also the opportunity for a warm-up on the piano with the band director, Pete Foley. In the past we’ve also had solo jazz instrumentalists come and enjoy the backing of the big band. It’s a very low-pressure event with the emphasis on fun and enjoyment. We also often have secondary students as young as 13 or 14 come sing at Jazz-aoke as it’s a very family friendly evening. Pete is music director of St Leonards College so very well experienced in working with younger people. Or people can just come along for a listen and perhaps decide if they want to sing the next session. Great food and drinks are available too. If you don’t know Dizzy’s it’s a lovely little club with a great atmosphere. It’s in Richmond close to Burnley Station. If you could forward this email on to your choir members that would be great. Bookings can be made through Dizzy’s on 9428 1233. 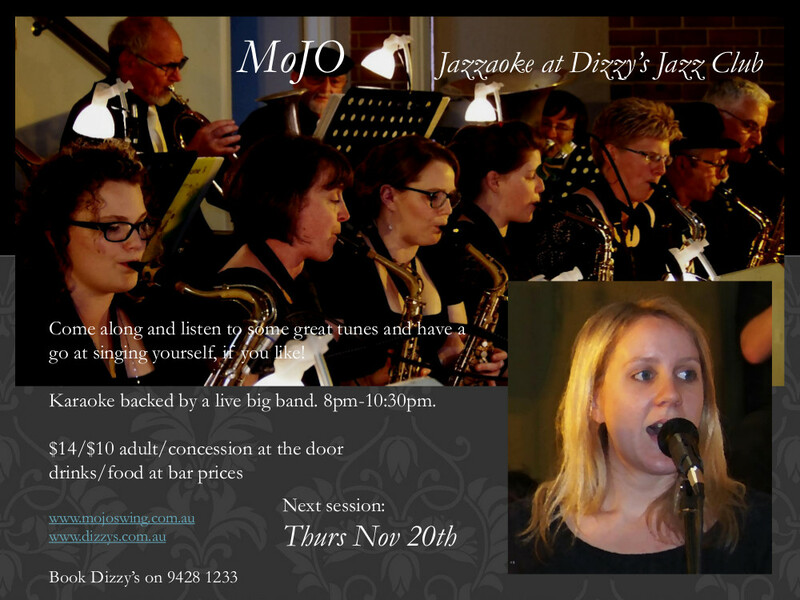 Or please get in touch with me if you would like any more information about Jazz-aoke with MoJO at Dizzys. Also you can let me know if you would like to be placed on our Jazz-aoke mailing list to be kept up to date with future MoJO sessions at Dizzy’s (we play around once a month or two), or if you would rather not hear from us again. Many thanks and looking forward to seeing you at Dizzy’s soon! Knowing how to read and play music is certainly is an awesome skills to have, but what about 'hearing' music? Developing your ear to hear what is happening in the music is the icing on the cake. Here are some great tips on hearing intervals and being able to name them as soon as you hear them. Firstly, let me quickly explain what an interval is. An interval is simply the distance between two notes. The musical alphabet is A, B, C, D, E, F, G. If note C is the root note and the consecutive note played is a G it would be a Perfect 5th, if the consecutive note was E it would be a major 3rd. Intervals will differ from minor and major scales. Let's just focus on the major scale to start with. Start by playing a snippet of the song that you will recognise when it starts to be played, as shown below (from the book Fast Track Lead Singer 1 by Blake Neely). Practice this three times and then play the root note and the interval... See if you can start to hear the song automatically as soon as you hear the first 2 notes played... Once you can, you will find it so easy to recognise. How Does Music Impact Your Life? 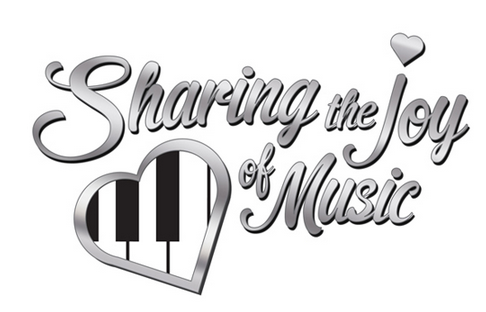 Music benefits us all in so many different ways. How does music impact your life? Music empowers people, to express who they are in a safe and encouraging way. I believe that Music Education is paramount to every individual no matter how musical or not musical we may think we may be. The facts are we are all made up of various vibrations that are all music related. Our heart beats in rhythm with our bodies, our blood swishes through our veins, we walk in time and in tune to our life and even in the stillness when we sleep our breath continues to create our own musical melody. Read here for "The Most Amazing Benefits of Music" a great resource exhibiting how music ripples throughout every facet of our lives. Music bridges gaps and brings people together it is multicultural and unbiased there is a sound for everything and everyone. We are music and to deny music in our lives would be crime. Music isn't always about being the best or a super star, its about just being. 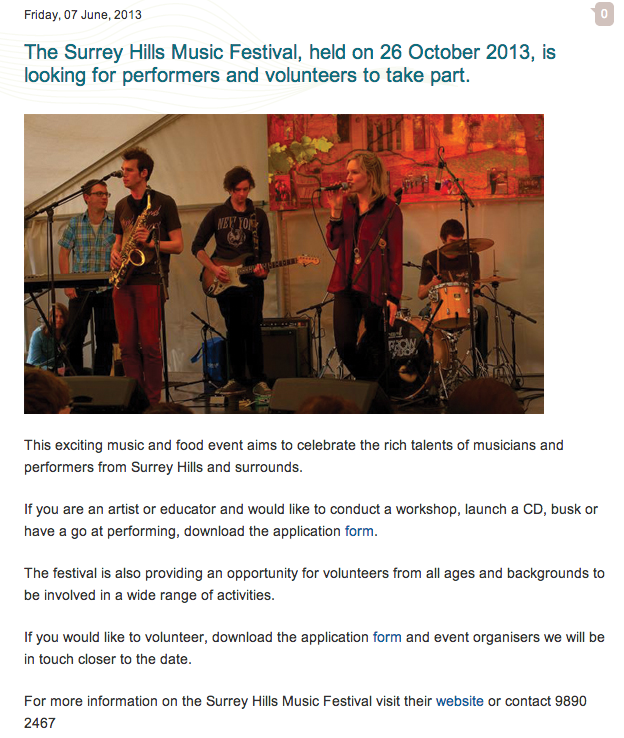 Calling all Performers & Volunteers! Another great opportunity to volunteer and/or perform! why not give this community singing competition ago! 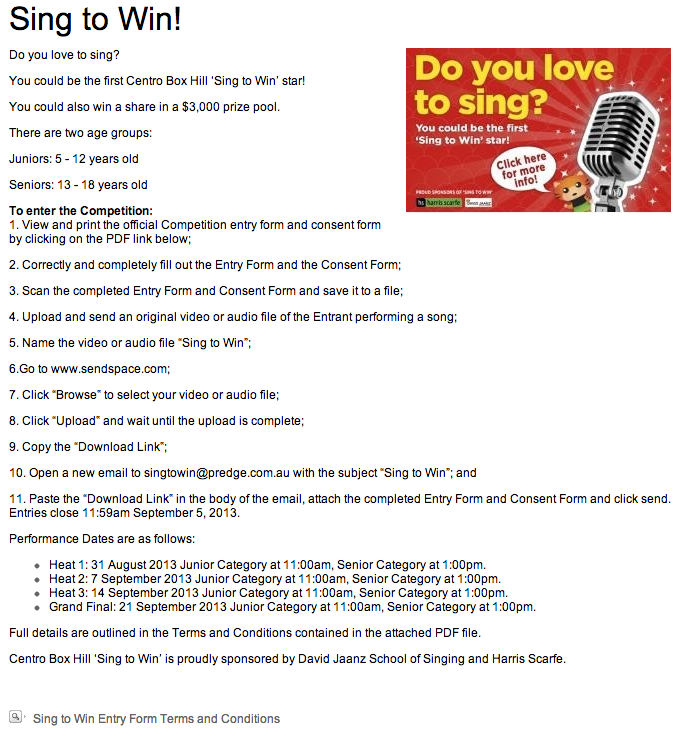 Box Hill Centro are holding a singing competition. Click ^ to find out more details.